How many puppet makers are there are in New York? Brooklyn? The country? I have no idea, but when a friend who is working on developing an online documentary network for kids called Children's Documentary Network asked if I wanted to visit a puppet maker for the site, I immediately said yes. What I found at a small Gowanus studio were these crazy silicon puppets inspired by rubber finger puppet toys, realistic animal sculptures, a bust of a human head, a life-sized bronzed sculpture of a dog, and the incredibly creative man who made them all. Owen Bissex has a background in creating extremely realistic animals for museums, which he’s very good at, but he’s also currently bringing to life these amazingly weird and fantastical puppets that could easily entertain and educate kids for hours on end. H&E: Ok so you’re the first puppet maker I’ve ever met, which is a pretty niche skill. Tell us how you got into it. It happened as an outgrowth of my work as a sculptor­ in fact it's probably more accurate to say I'm a sculptor who sometimes makes puppets. I've always dabbled in masks and parade puppetry but I started doing it more seriously when Children's Documentary Network (the company who I do most of my puppetry work for) contacted me a few years ago. They were wondering if I could make a scientifically accurate talking housefly for them. It was a complicated sculpture but a pretty rudimentary puppet, essentially a museum model with some moving parts, but I loved the challenge of incorporating motion into this thing and watching it come to life. Since then I've been working with them pretty consistently, expanding the cast of characters and making everything from miniature set pieces to finger puppets. H&E: You also make incredibly life-­like animals as well, even after leaving your job at the museum model studio. How is that the same or different than making the puppets? Do enjoy one more than the other? They dovetail nicely since the skills required are basically the same, given the nature of the puppets I'm making. There's a lot of mold making involved and various rubbers and resins, lots of things you'd find in a museum model shop. The aesthetic considerations are really all the same­ a thing is going to work visually or it's not and I like the puppets to be just as interesting to look at even when they don't have someone's hand shoved inside them. I wouldn't say I enjoy one more than the other but they definitely have different flavors. Sometimes you're just not in the mood to tackle a certain problem or work with a particular material, so it's nice to be able to bounce back and forth. H&E: When you were a kid were you particularly interested making things? When did you realize you were creative? I don't know if I was particularly interested in making things as a kid, more than anyone else. I mean almost everyone was drawing or playing with clay since before they can remember, but at some point when I was young I just became a little more obsessive about it and never stopped. 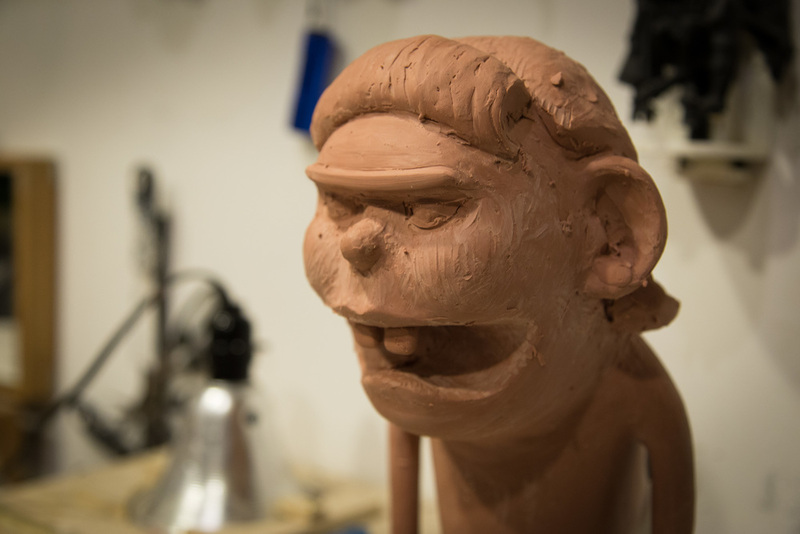 H&E: What are the primary materials you work with to make the puppets and the other life-­like animals in your studio? My favorite favorite process for sculpture is to model something in clay, mold it, and cast it in plaster. From there I'll often oil paint it to achieve whatever patina/effect I'm looking for. These materials feel very pure and direct to me:everything is done with hand tools, and the materials and techniques date back hundreds if not thousands of years. Most of the puppets are silicone rubber, which gives them a dramatic ability to move and stretch and allows for some very weird and unnatural colors and translucency. Pretty much the other end of the spectrum, materials-­wise. H&E: You mentioned how you like to make certain creatures, like that big walrus. What draws you to certain animals? Ungainliness. Awkwardness. Fat. I like the fact that animals that are so goofy or ignoble on the surface almost always have a deep dignity if you look at them hard enough. If you've ever had a labrador retriever you probably know what I'm talking about. H&E: Where do you get your inspiration from in general? What inspires you? I would say my biggest inspiration comes from study of the natural world­ so not just looking at how amazing and complex nature is, or drawing inspiration from being out in the wilderness (which is great of course) but also making an effort to understand why things are the way they are. I find the richer the understanding of a subject I have the more nuance and originality comes out in the piece. H&E: Do you have any projects you want to work on that you haven’t? Or things you want to create that you have not yet been able to? For a long time I've wanted to make a series of natural history based sculptures (animals and plants and the like) that would be donated to nature centers and smaller museums, places that might not be able to afford hand made art. As a kid art was always an easy way for me to enter into a subject, having information filtered through an artists hand. I get the impression it's either not prioritized as much these days in institutions or just not in the budget, but I'd love to be able to contribute in this way and I think it's important. I've only just started sending out some feelers as to whether anyone would be interested in this so we'll see how it goes.